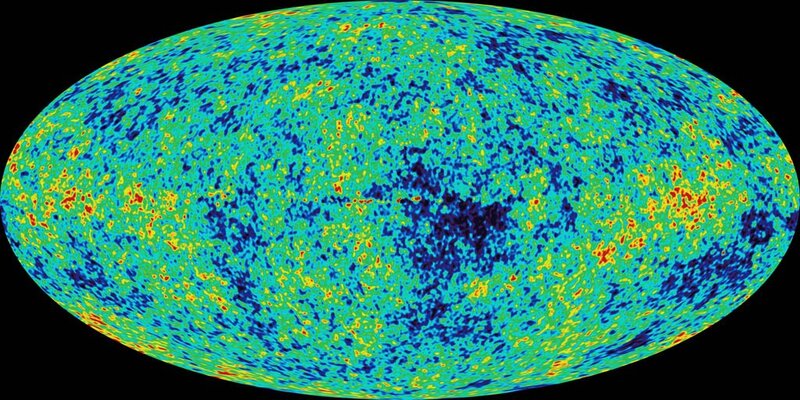 The Microwave Sky - The first detailed, all-sky picture of the infant universe. The image shows 13 billion+ year old temperatures as color differences that correspond to the seeds that grew to become the galaxies. Image is from the NASA/WMAP Science Team. 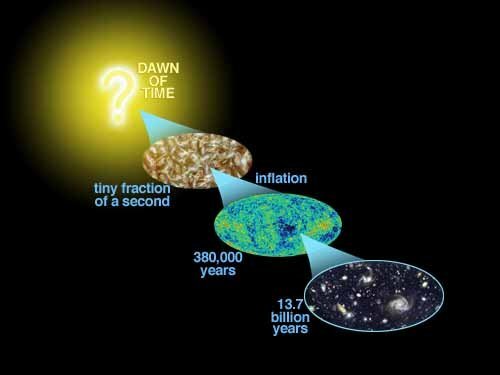 Astrophysics suggests that 13,700,000,000 years ago there was a big bang; actually it was not so much of an explosive bang as it was an expansion of space-time itself. All matter was thus created within a few heartbeats, creating an expanding plasma of the nuclei of hydrogen, helium and a bit of lithium, the lightest of the elements. From there, the laws of thermodynamics assured a continual cooling, thermal equilibrium and entropy increase. After some billion years, the cloud of interstellar dust began condensing due to the forces of mass attraction into a large ball of gas (our sun), and smaller lumps of miscellaneous debris (the planets including Earth). The sun is still primarily comprised the light elements hydrogen and helium, which, by the way, still comprise some 99.9% of the mass in the universe. The condensation produced tremendous energy, and things were very hot -- too hot on earth for water molecules to condense. 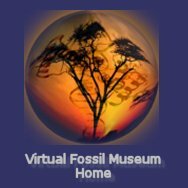 Over time, say 5,000,000,000 years ago the earth began to cool, molten minerals forming rock at the crust. Earth's original atmospheric was mainly hydrogen and helium was lost to space. Volcanic activity yielded steam, carbon dioxide, nitrogen and lesser other molecules that eventually formed a secondary atmosphere. Water condensed forming oceans and lakes. The genesis of life is thought to have occurred by means of chemical reactions in the atmosphere followed by reactions in the great mother of life - the sea.